A reverb with a few tricks up its sleeve, UltraSpace isn't going to change the world, but it makes some interesting sounds and comes in at a fair price. Excellent multitap delay. Ducking is useful. Manual tips are a nice touch. Graphics issues in some hosts. More routing options wouldn't go amiss. Delay time can't be unsynced from host. Billed as an all-in-one solution for all of your ambience needs, Tone2's UltraSpace combines a quartet of effects in a monolithic trio of virtual rack units, complete with handles and (purely cosmetic) patch cables. An oversized faux LCD screen (all it does is show the current preset name and selected parameter value) occupies the upper-left, surrounded by buttons for toggling through the presets, collapsing the GUI down to just the Mix and Volume knobs, switching the reverb and delay units between serial and parallel routing, accessing the manual, and launching Tone2's website. "UltraSpace sounds good and comes with some interesting presets, and the multitap delay is great"
The top 'rack' also hosts the Mix, Gate and Duck sections. The first contains Mix, Volume and Surround (stereo widening) knobs, and - in a rather silly bit of interface design - a pair of Monitor jack sockets that, when clicked, give you the wet-only signal. The Gate section comprises Threshold, Attack and Release knobs, as well as a Hold Time parameter that controls how long the gate is held open after the Attack stage completes. You can use the Gate to, say, do your best 'Phil Collins snare' or simply clean up overly splashy reverb tails. Using the Duck module's Level and Limit controls, you can dynamically control the dry/ wet mix based on incoming levels in order to achieve transparency with heavily effected material. When the incoming signal is hot, the mix tends towards the dry signal; when it's low, the wet signal is emphasised. It's a good idea that works well in practice, being especially effective on busy, heavily reverberated drum tracks. In the middle 'rack', the reverb itself has controls for Mix, Size, Decay, Diffusion, Pre- Delay, High and Low Damp, High and Low Cut, and the appropriately-named Swirl, which modulates the reverb tail for a thickening effect. 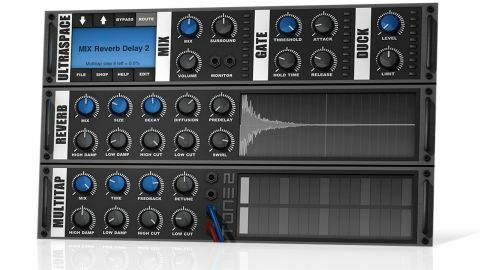 Overall, the reverb sounds good; some of the presets are quite 'artificial', but it boasts enough flexibility to enable fine-tuning of them to better fit a wide variety of applications, from short, dampened rooms to huge, reflective cathedrals. The tails aren't the smoothest we've ever heard, but they're by no means unacceptable in context. And we should note that the manual gives some very handy usage tips. Is UltraSpace, as the developer suggests, truly the ultimate in ambience processors? In a word, no. It is pretty cool, but there are a few obvious things that could make it better. First, it isn't bug-free. The VST version presented graphics errors on two different Macs and in multiple hosts. Hitting the Edit button to collapse the editor, then reopening it, blacked out the GUI in Cubase 7.5 and simply wouldn't re-expand in Reaper. Bitwig, Studio One and Ableton Live were fine, though, and the AU version had no such issues. Additionally, it would be a real plus to have more routing options. We'd love to be able to stick the delay before the reverb, for example. Nonetheless, UltraSpace sounds good and comes with some interesting presets, and the multitap delay is great. It isn't going to supplant our costlier 'verbs, which are better for standard, everyday spatial effects, but it offers a different approach, is easy to use and certainly qualifies as good value for money.